BSNL JE 2016 recruitment process almost completed and started joining the position. Lot of problem and restriction arises during 2016 recruitment process, due to first time BSNL organized online recruitment of junior engineer-JE (formally TTA) post. Minimum requirement qualification for the JE position is diploma in electronics engineering but higher qualifications are also eligible to apply this position. Last few years in India, throughout the country graduated huge number of engineers but most of the engineering graduated are jobless, due to lack of job vacancies. 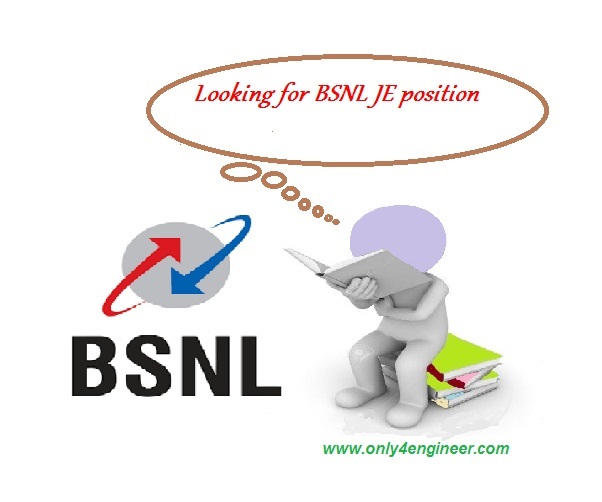 BSNL is the big ship of the electronics engineers, everyone waiting for BSNL vacancies. Last few years BSNL running with loss but now income increased. We are expecting recruitment in the year 2017-2018 after 2016 with more than 2000 vacancies in JE position from the different sources. Now a days increases competition in every recruitment examination a lot due to lack of job vacancies. Not an easy to crack the competitive examination in 2-3 months, take your time in hand and prepared your level best with self-satisfaction. The syllabus, examination pattern, previous year papers, books and study materials given in the bellow links, you can download from there. Like our facebook page for latest update of BSNL JE/TTA recruitment.